I got a sony wireless surround sound sound bar sub woofer 2 speakers for $349.00 and was $449.00 that was a great price works amazing! Also two stand up fans that rotate with remotes and smaller fans included in the box for free for only $39.95 like walmart would charge $70.00 at least. Love this place!!! Cant beat their prices on most things plus I won a 50 dollar raffle here once!!! I never win anything, that was a first! interesting odd lot discount store, cruise the aisles you’re certain to find a deal! Everything is here at great prices! Great prices I saved a great deal of money. The gluten free products are much cheaper than the grocery stores. I’m very happy because, gluten free products can be very expensive. This storeI is kinda like a really good mystery because you never know what items you’ll find but you always find something at reasonable price. I am hesitant to say how great this place is because I want to continue to get all of the goodies. Great place to get discount things. They have a little bit of everything like they say. Definitely give the place a look. They also accept EBT cards. There Prices are Amazing. And they really do sale a Little bit of Everything too food- too electronics. Such a family friendly store. They have a vareity of different items. I love going and finding something different. Excellent service and return policy’s. I just love the owners! Can’t wait to come back and buy more stuff. Literally a little bit of everything. They have some great prices on their everythings as well. Also, surprisingly they have some quality brands. I would skip some of the perishable food items and hygiene/beauty products considering their shelf life. Everything else is fair game. Go in often and see what they have to offer. If you see something you want, BUY IT. It will NOT be there the next time you go. A little dumpy but for the prices I will take it any day of the week. I love to bargain shop and this is part of the string of places on a day long bargain shopping adventure. Yes, anything and everything all over the place. Was expecting there to be more to it/bigger based on the exterior, but it housed plenty. Dented canned goods, flavors of snacks that didn’t sell all the well, tons of Wellesley Farms and Kirkland gifts/goodies. If you can’t deal with blg 19 like conditions, don’t go in. Clothing is always 50% off. Fun store. Looks much bigger on the outside. But it can be too cramped on the inside. The best way to describe this store. Is if a dollar store and a thrift store had a baby inside a warehouse. I’m also pretty sure they’re selling items that most dollar stores just couldn’t sell! Haha! I love exploring these types of discount stores. It’s always a treasure to see what you’re gonna find. Lol. So if you’re into dollar stores, discount stores, or “junk stores.” This might be a place you would wanna check out. The parking lot was busy when I got there around 3:45 today. I didn’t expect that at all. Like most discount stores. I thought the place would be dead. At least some people know how to find a good deal! Literally “A Little Bit of Everything “. We have bought everything from toothpaste to a massage chair (66% off). It’s a hit-or-miss. One day you may see an item that you may not see again so, if you want it, get it because it may never be back. Stopped by this place to see what they had to offer. Definitely a random assortment of items. Prices were great for sure. One piece of advice- this isn’t the place for you if you’re looking for a specific item… But instead it’s somewhere to go if you have an hour to spare and want to shop around for a great deal! The first thing I noticed walking up to this place was the 5 or 6 shopping carts liberated from as many different stores. I grabbed a stop and shop cart, and my SO grabbed a Kmart cart and we headed up the largest handicapped ramp I’ve seen. The first few aisles were all foodstuffs. Look for the ones that aren’t too dented. I filled up my food drawer at work with those little healthy choice microwavable pasta meals for $1 each. Lunch for 2 weeks = $10. Moving on to housewares, I really had to hold my self back from buying everything on site. I love kitchen gadgets. There were many ‘As seen on TV/ Slapchop/Shamwow-esque’ products. The prices are very low, because I’m assuming this is the kind of place that buys all the stuff Job Lot rejects. Boxes are dented, but everything looked new and usable. Luckily, I remembered I was broke and moved on. I really don’t remember the next few aisles. I think it was stuff on a shelf. Lots of good random stuff that I wanted. I swear it took me 10 minutes to walk down an aisle to really see everything. Hard to leave. Clothing section is nice and cheap as well. Everything was 50% off. Hilfiger shorts turned about to be about $10. As I walked to the register to cash out, I saw what I had been looking for. An acrylic cat pen with a colorful basket of yarn pen holder base. It’s on my desk at work now. Life is complete. 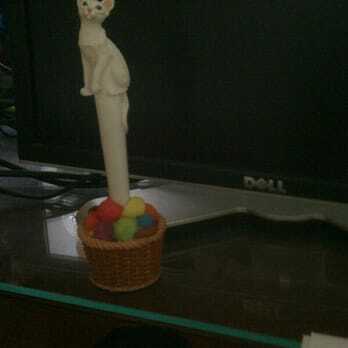 Acrylic cat pen with colorful yarn basket pen holder. Find it here. Don’t deny the heaven that is this store. Hyperbolic? Not a chance! The stock is amazing – organic, gourmet ramen-style noodles for .25€; tasty bite Indian food for .50€, which retails for $3.79 everywhere else; organic toaster pastries for .50€; aloe Vera- infused juice for .75€. I think you get the picture! Basically, you can buy whole foods style groceries for 75% off here, which is amazing. The staff is INCREDIBLY nice and gets really excited for you when you get great deals. This is a happy place. Run to it. Don’t be shy. There’s no stigma here – it’s not some junky “discount” garbage dump; it’s informed, value-packed shopping. Don’t get ripped off by paying full retail elsewhere. Save that money! From the outside, this looks like a place you might not want to go into. And the inside decor is nonexistent. Just plain metal shelves. But take a closer look and you’ll find bargains galore and closeouts of name-brand items. I love interesting food of all type and this place always surprises me. Many choices of breakfast cereals, cookies, crackers, K-cups, coffee and more. I always go in for one item and end up with a basket full of items. Examples: Popcorn Indiana Kettlecorn. Retail $5.85, here: $1.00. MEiitta Vienna Roast Coffee K-cups. Retail $ 10.52 on Amazon, here $5.99. Dancing Deer (great brand) Shortbread Cookies. Retail $4.75/ Here $1.00 St. Joseph Aspirin Regimen, 81 mg, Enteric Coated Tablets, 300 tablets. Retail $8.99. Here $1.00. Be sure to check the expiration dates on al items, however. (Personally, I don’t get too hung up on most expiration dates.) Today I left with three ful grogery bags od items and my total bill was $23.54. Yes they do sell food past their “sell by” date, but that date isn’t an expiration date and who cares when you’re talking about a sealed granola bar only two months past the sell by. They sell a whole lot more than food though, I’d give you a rundown but the inventory changes all the time. If you want to save some money and like bargain hunting, it’s a pretty cool place to check out. The name of this place really says it all. Their selection of merchandise was impressive. Not everything was at a discount price but I did find several items at a great value. I was a bit annoyed with the other shopper’s present. They seemed to lack common courtesy you share to others in a store. That is not something that can be controlled I guess. With such great deals you’re bound to attract those people. One thing I must mention tho is the clothing section. Everything is neatly assorted according to size aswell as color. It saved so much time usually spent picking through each rack. I will definitely be back again to score se great deals. Wow! Where else can you go to buy food, clothing & a friggin’ guitar. This place is great. I found some awesome deals on boxes & cans of food. The packages are slightly damaged, but who cares. If your use to shopping at Whole Foods, this place may not be for you. If your a Bld. #19 type of shopper & are looking for a surprise or hidden treasure, you’ll love this place. Cool staff were really helpful as well. The name says it all. This store is hit or miss, but more hits than misses. If you cant find what you’re looking for, ask a staff member. They will go above and beyond to find it if they have it in storage. Great prices. Great deals on clothes(always 50% off the ticket price) small appliances, vacuums, candy, snacks, and other odds and ends. Definitely worth a stop by! This store is not for everyone; one needs to enjoy the thrill of the hunt and be able to jump on a bargain when you see it. From men’s khakis to furniture to olive oil, you will truly find a little bit of almost anything. It is difficult to shop for a specific item, because they don’t stock items regularly, but rather put out what they have right then. However, there are many items that are regularly there. There always seems to be olive oil, for example, but not the big Kirkland jugs from Costco. (I only bought one, darn). This is a store where you stop in to see what’s there and usually come away with a bargain that you will be happy with.